HOUSTON, TX (February 10, 2017) Tanvi Jadhav, a senior at Tompkins High School, achieved a perfect score of 1600 on the June 2016 SAT exam. Although Tanvi’s academic and test taking credentials are incredibly impressive, they are by no means the only extraordinary thing about her. In addition to participating in Orchestra, Science Olympiad, and Mu Alpha Theta, a mathematics honor society, she also volunteers annually for the annual MS 150 event, a ride-a-thon fundraiser from Houston-to-Austin that raises money for MS research. 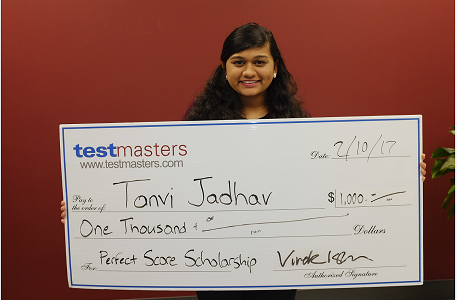 In recognition of her accomplishment Testmasters will award Tanvi a $1000 Perfect SAT Score Scholarship.